Fact Checking Liberty Counsel's New Video On "Religious Hostility In The Military"
The far-right Liberty Counsel released a video aimed at highlighting a climate of "religious hostility" in the U.S. armed forces, relying on sweeping, unsubstantiated statements from anonymous service members and citing easily-debunked examples of supposed anti-Christian bias. 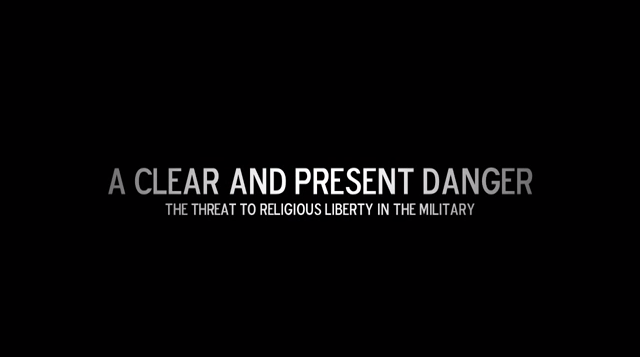 The video's claims are sure to be touted by self-appointed religious liberty guardians like Fox's Shannon Bream and Todd Starnes, but Liberty Counsel's attempt to demonstrate a war on religion in the military proves an embarrassing failure. "Christian Prayer Is Banned At Military Funerals"
This completely baseless allegation stems from a directive issued by a low-level Department of Veterans Affairs employee in the summer of 2011. Conservatives claimed that the VA had banned prayer at military funerals, but as ThinkProgress noted, the Houston Chronicle reported that the official had merely instructed employees to ensure that services reflected "the religious preferences, if any" of veterans' families. The myth that the official banned Christian prayers was debunked two years ago, but Liberty Counsel won't let a few stubborn facts get in the way of its scare tactics. "Walter Reed Medical Center Briefly Bans Bibles And Religious Material"
Even the conservative Washington Examiner admitted that Walter Reed's 2011 order banning Bibles and religious materials was an accident, and that hospital officials never enforced the order, which a spokeswoman said was "written incorrectly." While Walter Reed has always allowed families to bring religious material in, the FRC opportunistically turned this non-story into a spectacular controversy. "Army Censors Catholic Chaplains In Worship Services"
In 2012, Catholic Archbishop Timothy Broglio sent a letter to the military's Catholic chaplains stating that Catholics "cannot - [and] will not - comply" with the Obama administration's requirement that health insurance plans cover birth control, a mandate that Broglio called "unjust." CNN reported that the Army's chief of chaplains - a Catholic - feared that the letter called for civil disobedience, so he instructed chaplains not to read the letter at Mass, but simply to hand out copies at the end of services. The chief of chaplains' concerns regarding noncompliance with civil law weren't unreasonable given the military's emphasis on order and discipline. But he still allowed chaplains to convey their opposition to the contraception mandate - a fact that Liberty Counsel conveniently omits. "Airman Terminated For Objecting To A Gay Marriage In The West Point Chapel"
Fox's Starnes has aggressively touted this trumped-up case, even though there's no evidence that Tech. Sgt. Layne Wilson's anti-marriage equality views had anything to do with his dismissal. What instigated the National Guard's reprimand of Wilson wasn't his opposition to the wedding, but the flagrant disrespect he displayed for his military superiors in a letter he wrote regarding the West Point nuptials. Wilson accused his superiors of delivering "a slap in the face to us who have put our lives on the line for this country" and instructed them to "take appropriate action so this does not happen again." Despite what Starnes and Liberty Counsel seem to believe, there's a big difference between punishing an airman for his personal views and imposing consequences on an insubordinate member of the armed forces. While a few minutes' worth of fact checking expose Liberty Counsel's video as bunk, it promises to serve as a rallying cry for right-wing media outlets that see a grave threat to religious liberty lurking around every corner.